sector so we can ensure peace of mind when handcrafting your bespoke piece. Our skilled craftsmen can offer a full range of lettering and carving services coupled with advice on layouts, styles and finishes. 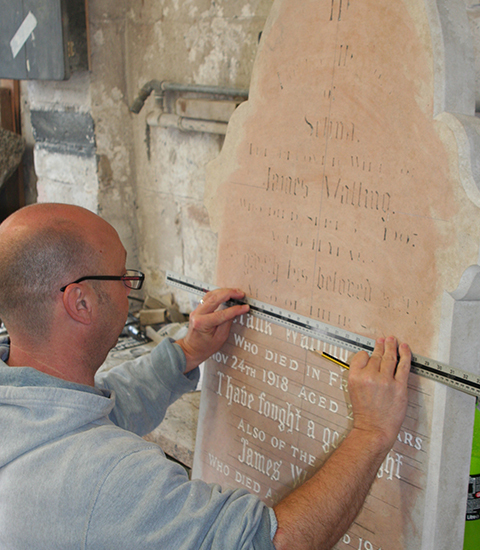 All work is carried out in our own workshops and whether it is for a memorial, Architectural Commission or a house or commercial name plate we undertake to provide the highest quality in service and craftsmanship. With many years experience in producing the highest quality memorials, let William & Triggs help and guide you in selecting the very best for your loved one. From choice of stone, design, inscription and layouts, to advice on the permissions, fees and regulations for your particular burial ground, lean on William & Triggs's caring and expert service.